Malaysia’s Prime Minister, Mahathir Mohamad, vowed to strengthen ties with the nation’s “twin” as he officially called for a review of water sold to the republic at the 33rd ASEAN summit in Singapore. 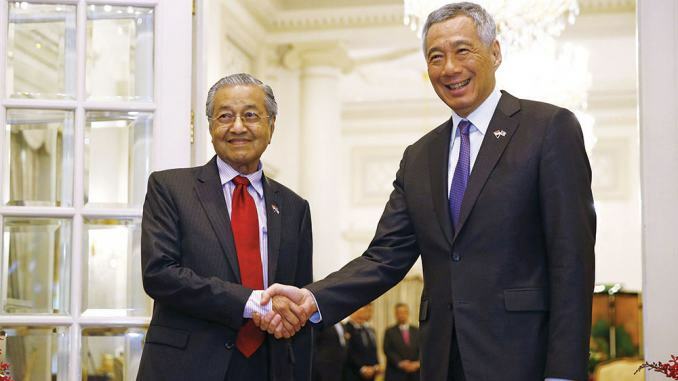 In the veteran leader’s first official visit to Singapore since he returned to power in May, Mahathir said he would work more closely with his Singaporean counterpart, Prime Minister Lee Hsien Loong, to solve “controversial” issues such as the 1962 Water Agreement. Under the longstanding agreement, which expires in 2061, Singapore is entitled to draw up to 250 million gallons of water daily from the Johor River, paying 3 sen ($0.0072) per 1,000 gallons. Singapore then treats the water and sells a portion back to Malaysia at 50 sen ($0.12) per 1,000 gallons. The 93-year-old has routinely hit out at the agreement as being “too costly,” “ridiculous,” and “unfair,” saying it no longer matched living standard costs in Malaysia. “I think it is manifestly ridiculous that we should sell water at 3 sen per thousand gallons. That was okay way back in the 1990s or 1930s. But now what can you buy with 3 sen? Nothing,” he told Channel NewsAsia in June. But during his first bilateral talks with Lee, Mahathir was quick to highlight the close ties between Malaysia and Singapore, adding that they must work on improving relations despite their differences and competition. Mahathir added that the two countries are “mutually dependent” on each other in many ways, such as trade and investment. Malaysia’s second largest trading partner after China is Singapore, with trade between the pair representing 12.4 percent of its global trade last year. “There is much at stake in this relationship between Singapore and Malaysia, and I’m glad to make this visit and help in discussions with Mr Lee on our relations and how to improve the relations,” he continued. Singapore has depended on Malaysia for almost half of its water needs through a series of agreements which go as far back as 1927. Last month, Malaysia’s deputy Foreign Minister Marzuki Yahya said Malaysia could review provisions of the agreement after 25 years and was entitled by law to review the cost of water. But Singapore has always been firm in its view that Malaysia’s right to renegotiate the cost of raw water supplied under the agreement was lost in 1987 when Malaysia turned down the opportunity of a price review. Under the current arrangement, Singapore provides Johor, Malaysia, a subsidy of RM1.90 ($0.45) per 1,000 gallons of treated water, The Star reported. Following the bilateral talks between the two leaders at the ASEAN summit, the Ministry of Foreign Affairs (MFA) for Singapore said it is willing to further discuss Singapore’s position on the agreement with Malaysia. “Both sides expressed their differing views on the right to review the price of water under the 1962 Water Agreement,” a spokesman for Singapore’s MFA said in a statement on Nov. 12. Mahathir later said officials from Malaysia and Singapore will soon meet to discuss the issue. In August, Mahathir’s scandal-ridden predecessor, Najib Razak, was charged with three counts of money-laundering breaches linked to state fund 1Malaysia Development Berhad (1MDB). Malaysia’s national debt currently stands at approximately $175 billion. “It is likely that Singapore will negotiate as it is in the interest of having a good relationship with Malaysia. Singapore is hesitant, but they may agree to pay a slightly higher rate. “But Singapore could come back with an alternative deal, which may not be as high as what Mahathir wants,” Dr. Koran told The Epoch Times. Mahathir’s call for a review of the agreement comes amid a string of bumps in projects formerly agreed to under Najib’s leadership. In September, Mahathir announced the suspension of a long-awaited multibillion-dollar high-speed rail project that was to connect Kuala Lumpur to Singapore. The project, which was proposed to open to the public in 2026, has been pushed back to 2031. Dr. Choong Chee Keong, a professor at the Universiti Tunku Abdul Rahman Faculty of Business & Finance, believes Singapore won’t immediately accept a change to the agreement on Malaysia’s terms and that Mahathir’s push to renegotiate could have a short-term adverse effect on Malaysia-Singapore relations. “I don’t think Singapore will just accept the deal. If the leaders of these two countries don’t manage the water deal well, I’m sure it will have a negative impact on their diplomatic relations,” he said in an interview with The Epoch Times. Meanwhile, Dr. Koran believes Mahathir’s “cooperative” dialogue with Singapore during the summit—which he says is usually “critical”—is a sign Malaysia’s attempts to renegotiate will not damage relations.